If you have previously read my columns, you know that baseball is my favorite sport and that I am a fan of the St. Louis Cardinals. That’s why baseball has often been mentioned in my columns. So if baseball is not your thing and you’re tired of my mentioning it, you may want to consider replacing me. Actually, my second term ends next July and, next to baseball, I am a fan of term limits. But, back to baseball…. The 2013 World Series is over. The Cardinals did not win it, but they had a very successful season. All teams that are playing in October can say they had a successful season, and those that are playing in the final game of the post-season can say they had a very successful season. I write this because things happened in the 2013 baseball season that I find analogous to what’s happening in the WSJ Society. The Cardinals, like some other teams, were hit by injuries to some key players during the season. They replaced them with a number of young, unproven players who caught the spirit of the organization and performed beyond expectations. They worked together as a team and picked each other up as players typically go through performance cycles. That’s what makes a winner. See what’s happening in the WSJ Society. We lost some key members of our board and officers in the past couple years. New members have replaced them and are bringing new life to the organization, specifically the work that has and is being done by Jude Anders and Greg Pascucci. Both have been major contributors to the design of WSJSociety.com. Jude is the Editor for the website and is working passionately at making it appealing and successful. Please register if you haven’t already done so! Greg is our Membership VP. With the launch of the website, his duties have increased significantly. He’s making sure enrollment is handled smoothly. As we know from our experiences at JCI, it is not the effort that we applaud, but the results. How do we measure results? It is by the increased participation of our members – connecting with one another, contributing stories and pictures, and by growth in membership. It’s a team effort involving all members of the society. 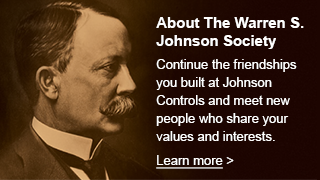 WSJSociety.com is a major tool that helps make that happen.